"I'm worried that students will take their obedient place in society and look to become successful cogs in the wheel - let the wheel spin them around as it wants without taking a look at what they're doing." The great social historian Howard Zinn, author of A People's History of the United States, died yesterday of a heart attack. Zinn devoted his life to educating Americans in their country's history, that they might better understand their place in its present. Such understanding is today at a premium. Ours is a time of confusion, of unprecedented changes that outpace our perceptions. As Zinn might have said, the wheel keeps spinning faster, and the faster it spins the harder it is to see. At such times, and at such speeds, the task of educating ourselves becomes all the more urgent. We are citizens of a democracy, and democratic citizenship has always been a difficult skill to master. This is why Aristotle tells us that, in an ideal state, citizens would possess ample leisure time: the education of a citizen depends upon contemplation, deliberation, and training. Citizenship requires cultivation and, as any farmer would tell us, cultivation takes time. Perhaps it seems a waste of time to discuss video games at a moment like this. After all, this is a serious discussion, and games are supposedly frivolous things. Most any concerned parent might say, "Play is an occasion of pure waste: waste of time, energy, ingenuity, skill, and often of money…." So said Roger Caillois in his book, Man, Play, and Games. Of course, Caillois went on to praise games as a source of joy, as well as a healthy means of "escape from responsibility and routine." For Caillois, as for Aristotle, games are in fact essential to citizenship: they allow us to refresh and renew ourselves, help to socialize us, and afford us opportunities to cultivate our imaginations and reasoning skills. If games are essential to citizenship, then this could be a promising time for our democracy. According to a recent survey, over half of American adults play video games, and one in five play everyday or almost everyday. Does this mean we are becoming better citizens? Ninety-seven percent of American teenagers play video games. Does this mean they will become more politically active? Before you dismiss these questions, keep in mind that in October 2008, then-Senator Barack Obama became the first U. S. Presidential candidate to advertise in video games, when his "Early Voting Has Begun" ads appeared in Madden 2009, Burnout Paradise, and other Electronic Arts video games. Much has been made of President Obama's sophisticated use of new media technologies. He utilized the internet extensively in organizing and raising funds for his campaign, and has maintained an active presence on popular social media sites, such as Facebook, Twitter, and Flickr. To illustrate, he is currently taking questions about last night's State of the Union address via YouTube, and plans to answer those questions next week in a live, online video feed. While it remains unclear how such events are affecting politics, it is clear that new media technologies pervade the sociopolitical realm. So we cannot simply dismiss video games and Facebook as mere ‘wastes of time.' Instead, we are obligated to educate ourselves about them, and to try to understand what they mean, and what it means that we use them. With this in mind, it seems appropriate to examine the most popular video game in America. Farmville is a free, browser-based video game that is played through one's Facebook account. Users harvest crops, decorate their farms, and interact with one another, in what is ostensibly a game about farming. While this may sound like a relatively banal game, over seventy-three million people play Farmville. Twenty-six million people play Farmville every day. More people play Farmville than World of Warcraft, and Farmville users outnumber those who own a Nintendo Wii. This popularity is not surprising per se; even in the current recession, video game revenues reached nearly twenty billion dollars in America last year. The video games industry is a vibrant one, and there is certainly room in it for more good games. Farmville is not a good game. While Caillois tells us that games offer a break from responsibility and routine, Farmville is defined by responsibility and routine. Users advance through the game by harvesting crops at scheduled intervals; if you plant a field of pumpkins at noon, for example, you must return to harvest at eight o'clock that evening or risk losing the crop. Each pumpkin costs thirty coins and occupies one square of your farm, so if you own a fourteen by fourteen farm a field of pumpkins costs nearly six thousand coins to plant. Planting requires the user to click on each square three times: once to harvest the previous crop, once to re-plow the square of land, and once to plant the new seeds. This means that a fourteen by fourteen plot of land-which is relatively small for Farmville-takes almost six hundred mouse-clicks to farm, and obligates you to return in a few hours to do it again. This doesn't sound like much fun, Mr. Caillois. Why would anyone do this? One might speculate that people play Farmville precisely because they invest physical effort and in-game profit into each harvest. This seems plausible enough: people work over time to develop something, and take pride in the fruits of their labor. 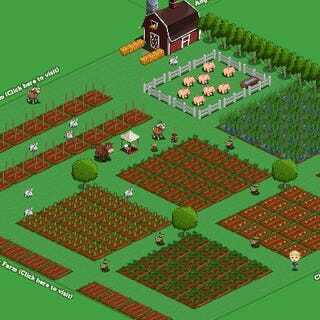 Farmville allows users to spend their in-game profits on decorations, animals, buildings, and even bigger plots of land. So users are rewarded for their work. Of course, people can sidestep the harvesting process entirely by spending real money to purchase in-game items. This is the major source of revenue for Zynga, the company that produces Farmville. Zynga is currently on pace to make over three hundred million dollars in revenue this year, largely off of in-game micro-transactions. Clearly, even people who play Farmville want to avoid playing Farmville. If people don't play Farmville because of the play itself, perhaps they play because of the rewards. Users can customize their farms with ponds, fences, statues, houses, and even Christmas trees, and compare their farms with those of their friends. It's important to note that Farmville is a public game, shared with friends across the largest social networking site in America. It makes sense that some people would enjoy the aesthetics of Farmville, of designing and arranging their farms. No doubt some users want to show off their handiwork, and impress and compete with their virtual neighbors. Nevertheless, it is difficult to imagine seventy-three million people playing a game that isn't fun to play, just to keep up with the Joneses. After all, we have real life for that sort of thing. Even Zynga's designers seem well aware that their game is repetitive and shallow. As you advance through Farmville, you begin earning rewards that allow you to play Farmville less. Harvesting machines let you click four squares at once, and barns and coops let you manage groups of animals simultaneously, saving you hundreds of tedious mouse-clicks. In other words, the more you play Farmville the less you have to play Farmville. For such a popular game, this seems suspicious. Meanwhile, Zynga is constantly adding new items and giveaways to Farmville, often at the suggestion of their users. Hardly a week goes by that a new color of cat isn't available for purchase. What fun. Again: if Farmville is laborious to play and aesthetically boring, why are so many people playing it? The answer is disarmingly simple: people are playing Farmville because people are playing Farmville. My mother began playing Farmville last fall, because her friend asked her to join and become her in-game neighbor. In Farmville, neighbors send you gifts, help tend your farm, post bonuses to their Facebook pages, and allow you to earn larger plots of land. Without at least eight in-game neighbors, in fact, it is almost impossible to advance in Farmville without spending real money. This frustrating reality led my mother-who was now obligated to play because of her friend-to convince my father, two of her sisters, my fiancée and (much to my dismay) myself to join Farmville. Soon, we were all scheduling our days around harvesting, sending each other gifts of trees and elephants, and posting ribbons on our Facebook walls. And we were convincing our own friends to join Farmville, too. Good times. The secret to Farmville's popularity is neither gameplay nor aesthetics. Farmville is popular because in entangles users in a web of social obligations. When users log into Facebook, they are reminded that their neighbors have sent them gifts, posted bonuses on their walls, and helped with each others' farms. In turn, they are obligated to return the courtesies. As the French sociologist Marcel Mauss tells us, gifts are never free: they bind the giver and receiver in a loop of reciprocity. It is rude to refuse a gift, and ruder still to not return the kindness. We play Farmville, then, because we are trying to be good to one another. We play Farmville because we are polite, cultivated people. (6) Farmville is not make-believe, in that it requires neither immersion nor suspension of disbelief. Of these points, the fourth is the most troubling. While playing Farmville might not qualify as work or labor, it is certainly a productive activity, as playing Farmville serves to enlarge and strengthen social capital. Capital is defined as "any form of wealth employed or capable of being employed in the production of more wealth." New media companies like Zynga and Facebook depend upon such wealth in generating revenue, just as President Obama depends on social capital to raise money, to organize, and to communicate. Unlike President Obama, though, Zynga is not an elected official, and is not obligated to act with the public's interests in mind. Zynga has recently used Farmville to raise almost one million dollars to support earthquake relief efforts in Haiti. Social capital can allow organizations to do great and noble things, and to do so quickly and efficiently. Zynga actually began its charitable efforts with Haiti last fall, around the time my family began playing Farmville. Also at this time, Zynga was engaged in numerous "lead gen scams," or advertisements that trick customers into making purchases or subscribing to services. As of November, one third of Zynga's revenue (roughly eighty million dollars) came from third-party commercial offers, such as Netflix subscriptions that came with Farmville bonuses, or surveys that involved hidden contractual obligations. One user reportedly was charged almost two hundred dollars one month, as a result of cell-phone services for which she had unknowingly signed up, while following Farmville ads in search of bonuses. So many users were scammed, in fact, that Zynga and Facebook are now involved in a related, multi-million-dollar class action lawsuit. The wheel keeps spinning, faster and faster. More people are signing up to play Farmville every day, as well as other similar Zynga games, such as Mafia Wars, YoVille, and Café World. Analysts estimate that, if the company goes public in the summer of 2010, Zynga will be worth between one and three billion dollars. This value depends in its entirety on the social capital generated by users, like you and me, who obligate one another to play games like Farmville. Whether this strikes you as a scam or just shrewd business is beside the point. The most important thing to recognize here is that, whether we like it or not, seventy-three million people are playing Farmville: a boring, repetitive, and potentially dangerous activity that barely qualifies as a game. Seventy-three million people are obligated to a company that holds no reciprocal ethical obligation toward those people. It is precisely at a moment like this-when Citizens United v. Federal Election Commission has made it legal for corporations to spend unlimited monies on political advertisements-that we must talk about our relationship to corporations, and to one another. We are obligated to examine what we are doing, whether we are updating our Facebook status or playing Call of Duty, because the results of those actions will ultimately be our burden, for better or for worse. We must learn above all to distinguish between the better and the worse. Citizens must educate themselves in the use of sociable applications, such as Wikipedia, Skype, and Facebook, and learn how they can better use them to forward their best interests. And we must learn to differentiate sociable applications from sociopathic applications: applications that use people's sociability to control those people, and to satisfy their owners' needs. As cultivated citizens, we are obligated to one another. We care about one another. As Cornel West has said, democracy depends upon demophilia, or love of the people. Unfortunately, sociopathic companies such as Zynga depend upon this love as well. The central task of citizenship is learning how to be good to one another, even when-especially when-it is difficult to understand our own actions. If Howard Zinn had but one lesson to teach us, it is that cultivated citizens must constantly look around and examine what they're doing, because there is a fine line between being a cultivated citizen and being someone else's crop. Caillois, Roger. Man, Play, and Games. New York: The Free Press of Glencoe, 1961 (pp. 5-6). See Aristotle, Politics, from line 30 of 1337b, to line 15 of 1338a; see Caillois, ibid, pp. 37-41. These statistics were derived from a PEW Internet Project Data Memo, dated 7 December 2008 (http://www.pewinternet.org/~/media//Files…). This was reported in various media outlets, including The Huffington Post (http://www.huffingtonpost.com/2008/10/14/oba…) and Fox News (http://www.foxnews.com/story/0,2933,4…). Newheiser, Mark. "Farmville, Social Gaming, and Addiction." Gamasutra 04 Dec. 2009 (http://www.gamasutra.com/blogs/MarkNewh…). Reuters Blog, 17 Dec. 2009 (http://blogs.reuters.com/mediafile/2009…). Mauss, Marcel. The Gift. Chapter One of version available online at Google Books France (http://books.google.fr/books?id=xlkVA…). Arrington, Michael. "Scamville." TechCrunch 02 Nov. 2009 (http://www.techcrunch.com/2009/11/02/sca…). Lusicombe, Belinda. "The Troubling Rise of Facebook's Top Game Company." Time Online 30 Nov. 2009. Arrington, Michael. "The Scamville Lawsuit." TechCrunch 12 Nov. 2009 (http://www.techcrunch.com/2009/11/12/the…). West, Cornel and Roberto Mangabeira Unger. The Future of American Progressivism. Boston: Beacon Press, 1998 (p. 12). Reprinted with permission from Media Commons. A. J. Patrick Liszkiewicz (http://www.reddyeno5.com/afeeld/) is a media artist and scholar. You can reach him at liszkiewicz [at] gmail [dot] com and follow him on twitter as @afeeld.